Back in May 2007, I stumbled upon the excellent Clematis site of Brian Collingwood. I am delighted to say that I have been in contact with Brian and he has agreed that some of his tricks of the trade are published here on Landscape Juice. If you want to try your hand at hybridising your own plants it's not that difficult a task – even ordinary amateurs such as you or I can manage it. It will multiply your enjoyment of the process of germinating and raising seeds greatly... not only because you are growing new, unique plants but also because they are your new plants. You will be the very first person to see the new flowers, which, without fail, will be ultra-fascinating and very exciting. Amateur - but reasonably effective - system for cross-pollination; image shows emasculated flower of ‘Madame Edouard André’…the sepals and anthers/filaments removed, leaving the isolated stigmas to await pollination, when receptive. Cotton wool is wrapped very lightly around the stem (not in picture - see later pictures) where it meets the seal, and the whole is enclosed by the bag, keeping insects out. It's a simple yet practical system that works well enough to successfully cross clematis of this type. In the context of this article ‘hybridisation’ means the production of seed from one plant (hybrid or species clematis) by deliberately pollinating one of its flowers with the pollen of another different clematis plant, to bring about fertilisation; this is a ‘deliberate cross’. Combining parents is this way results in genetic change. The resultant seeds are then germinated and the plants raised to the flowering stage, in order that the form of the ensuing flowers can be seen. The cycle never varies: pollination, seed formation, germination, growth, flowers. This is entirely different from the various vegetative means of reproducing a specific plant by layering, taking cuttings, grafting, and so forth. These methods increase the numbers of a particular plant, or clone, and do not result in the creation of a new, unique plant with a different genetic identity. For example, if you take cuttings from C. 'Jackmanii', and culture them until they form roots, then put them into pots, you'll get lots of new plants of C. 'Jackmanii'. But they will be copies, identical copies, of the parent plant. All the many millions of C. 'Jackmanii' plants currently in existence have resulted from the vegetative cloning of the first and only unique plant of C. 'Jackmanii' raised from seed sowed in 1858, germinated in Spring 1860, first flowering in 1862, exhibited at the Kensington Flower Show of 1863, and marketed in 1864. Hybrids sometimes (but not always) display intermediate characters in the form of leaves, height, flower type etc. In some cases the resulting new plants might be very similar to either parent or, sometimes, markedly different from both parents; the degree of difference can vary widely. The overriding determinant of the outward appearance, that is, the ‘blueprint’ of any plant, is the DNA within the nucleus of the cells. The physical appearance – the ‘phenotype’ of the plant, including the form of the flowers – is determined by the sequences of DNA which make up the genes – the ‘genetic code’. The genes are organised into discrete units called ‘chromosomes’, something like beads on a string. When fertilization by deliberate cross-pollination occurs, the genetic sequence – the ‘genotype’ – is changed, to a greater or lesser degree. In this fleeting continuum, the seeds are the conveyors of genetic change. It is impossible to foresee exactly what any resultant new plants may be like. And therein lies the excitement. Given that you can deliberately choose which plants to ‘cross’, you can set out on a planned programme, in order to explore the nature of plants resulting from deliberate hybridisation. Watching your own new, unique clematis come to flower can be very, very thrilling, because, until the actual moment of the opening of the first new flowers, the result is UNKNOWN. If you want to try your hand at hybridising, it pays to put together a ‘hybridising kit’. You need; a sealable plastic container, for keeping your things in (see photo below); some small, fine scissors to enable you to work cleanly and accurately; some cotton wool; some filter paper (optional); some re-sealable small plastic bags for isolating the female parent (or other bags, paper, cloth etc if you can get them or make them); some plant labels (that can be attached to a flower stalk); indelible (really!) marker pen for labels; a small notebook and pen for organising your records; small envelopes; a quantity of plastic-coated wire twist-ties (handy to anchor flower stems where you want them); and plastic bags for keeping things dry if you are working outside! Not essential but desirable – a smallish, but reasonably strong magnifying glass is useful, or an eye-lens: ideal (as used by a jeweller or watch-repairer). n.b. Stamen = filament, anther, connective. Anthers bear the pollen. 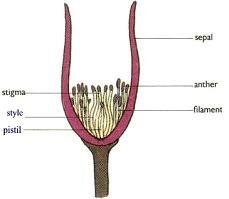 Pistil = ovary, style, stigma. Stigmas receive the pollen. This is a basic summary for people who want to try for themselves. It is not so difficult to do. You teach yourself how, by doing it. You'll find yourself sowing your own ‘hybridised’ seed, pretty soon! Get your ‘kit’ ready in advance of doing your crosses; so everything is to hand when required. The aim is to transfer viable pollen from the anthers of one plant onto the stigmas of another. No third parties! When hybridisation is done the ‘female’ parent – the plant on which the seeds are created and nurtured – is known as the ‘seed parent’. The other plant, of course, is called the ‘pollen parent’. Firstly, you remove the sepals (‘emasculation’), and then the stamens from the flower of the selected seed parent, so as to prevent 'self-fertilisation'. This is done just before the flower would normally have opened naturally. (Because the flower is not yet open, there is much less chance that fertilisation has already occurred.) This leaves the central mass of (female) stigmas standing alone. Once the chosen pollen is introduced, hopefully nature will take its course. The pollen attaches to the stigmas and begins to grow into the stigma, forming a pollen tube, down which the male genetic material graduates, until it reaches the ovaries. Fertilisation takes place. 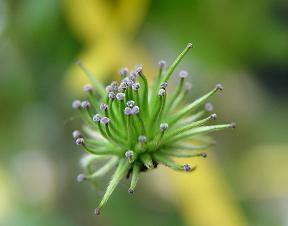 The pollen gametes hopefully succeed in fusing with the genetic material of the female and the new cells so formed begin to divide and differentiate until, ultimately, the seed is fully formed. Once fertilisation has occurred, the plant becomes indifferent to further pollens so after a further day or two the isolation-bags are removed, and the seeds then allowed to develop and ripen naturally, until ready for harvest. Crosses between your own garden plants are relatively easy to achieve (because the plants are already growing in your garden!) so, for example, 'King Edward VII' and 'Joan Picton' could be ‘crossed’ anytime when both plants are in flower. With a range of, say, large-flowered hybrids and various Viticellas in the garden the possibilities begin to magnify. More complex (or adventurous) crosses might include those which involve a cross between a large-flowered hybrid (there are many to choose from!) and a species clematis, for example, one might try 'Joan Picton' crossed with C. texensis pollen. It is no problem to maintain such species plants for breeding purposes in containers. A step further - a species crossed with another species, for example, C. integrifolia crossed with C. pitcherii or C. patens crossed with C. coactilis. 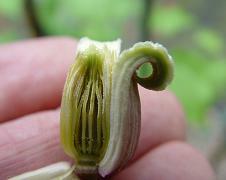 Some types of clematis are in fact incompatible as breeding partners. But a very large number will cross successfully. Many, many, combinations remain as yet untried. There is ample scope for even the most inexperienced amateur to produce really exciting plants from crosses which have never been tried before. However, in almost all cases such crosses would be carried out in the same way. So once you have completed one type of cross there is no particular further technique to learn when expanding the range of crosses. (It does help to read the literature about the possibilities for compatibility.) 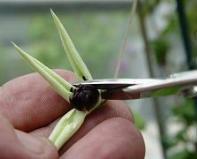 So the following simple steps will suffice for many different clematis crosses. 1. Decide on the seed parent: in this case, C. florida species. You only need one flower for each cross; hopefully you'll have a good, vigorous plant, with plenty of buds to choose from. 2. 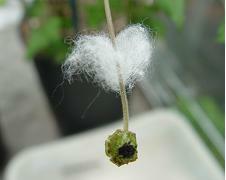 Decide on the pollen parent: in this case (a plant raised from seed labelled as) ‘C. viorna’. which means that plant 106B = C. florida, was emasculated (and isolated within a bag) on June 27th and then received pollen from plant G52 = C. viorna, on the 29th June. 4. 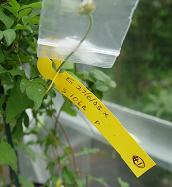 Attach the label to the chosen flower, on the chosen seed-parent plant, around the stem. Record the details also in your notebook, as per the headings above. You cannot remember it all - so put it in writing. Number each cross done. Make sure your records are right every time - double-check every entry. You'll want to look back at what you did last year, and when; so records are, or will develop, great value. They are key. The records go straight from the notebook to the computer. 5. 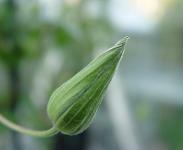 On the seed parent you need a flower which is almost, but not quite, opening. 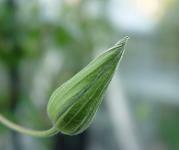 Here's a flower bud which is ready to open; I have just popped a bag around it, to keep insects away from the flower, for a few hours, prior to getting the hybridisation process completed later in the day, when time permits. Only a few hours later this flower is beginning to open. Good timing! Lucky! The normal development sequence of the flower, were it to be left to complete its natural cycle on the plant, would be as follows: The flower begins to open: Stamens are still tightly bound together and pollen is not visible. The flower opens fully and the characteristic white of C. florida rapidly 'bleaches-in' - a sight to behold! Pollen is just about beginning to be visible on the anthers, though little has yet been shed. In due course, as the flower matures, the anthers fully unfurl and begin to shed pollen. Soon, 'self-pollination' (pollination of the flower by its own pollen) would probably normally occur; however, we do not want the flower to self-pollinate, because we are going to introduce 'foreign' pollen, from another floral source, in order to achieve 'cross-pollination' (pollination of the flower by pollen from some other individual flower). We want to remove any chance of self-pollination. Hence we need to remove the flower’s own anthers (its pollen source), and isolate it from insects that may bring in any other 'foreign' pollen in the course of their flower-visiting activities. So, take your fine scissors and, firstly, pull open the sepals of the flower, and then carefully emasculate the flower: that is, remove all the sepals: this exposes the inner part of the flower. A note on the type of bags to use. The compromise of available materials. Use a small bag to isolate the flower head. Plastic bags will do the job if handled correctly and are easily and cheaply obtainable in the required size. In an ideal world one might use a purpose-made bag, perhaps in a more natural material, that could be drawn shut at the base, around the flower stem. But obtaining them is not easy! Here, a compromise can be made for the sake of expediency and the results are still good. Some air circulation can be achieved and condensation can be kept to the minimum; and they definitely exclude insects. The required bags have a seal-strip at the open end, this is effective enough to 95% isolate the flower. A complete 100% seal around the stem is obtained by utilising a cotton wool 'plug' - see next pictures – this way, some air movement is possible and condensation does not build up too much, especially if the bag is not exposed to direct sun. 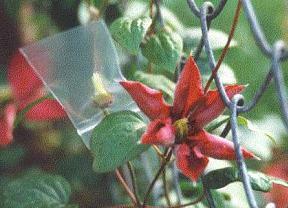 The bags, when in place on the plant, must be screened from the sun's direct rays – otherwise, the emasculated flower, sealed-in, and exposed to a hot environment, will quickly die. Or, condensation will quickly accumulate and the emasculated flower will rot. So, once the isolation bag is in place, ensure the flower is always fully shielded from the sun's direct rays. Always store 'breeding plants' (which are easy to manipulate if in pots) in the more-shaded area of the greenhouse or garden. If you are using a plant growing in the open garden, try to pick flowers which are screened by foliage; or, introduce a physical barrier to block out the sun's direct rays. During the whole hybridisation process the bags are in place for about a week or so. The plants can tolerate the plastic bags for several days before fertilisation, and several days after - enough time to get the job done. After fertilisation has taken place the flower fairly soon becomes indifferent to further pollens and therefore no longer needs isolation. Once the week (approximately) is over, the bag is no longer needed and can be removed and discarded. After the bags have been discarded it is unlikely that any further damage could occur and the fertilized flower now has a very high chance of successful natural development. So although plastic bags are not ideal, they are good enough for the purpose, in my experience, most of the time. If you can get better bags, let me know! 6. Wrap a wisp of cotton wool around the stem a centimeter or two above the emasculated flower. First (optional) insert a small piece of filter paper in the bag, then carefully coax the flower head into the bag, then seal the bag, around the cotton wool, wrapped lightly around the stem (filter paper omitted, to show seal). After a few tries you'll get it right every time! It's easy even for someone as ham-fisted as me! If necessary, use a wire-tie to keep the stem and bag in the position you want them to be – stable, out of direct sun, upright, easy to reach and manipulate. If you keep the bag upright, any condensation can run down into the cotton wool and be lost to the outside. I repeat, keep them out of the sun; minimise direct sunlight. In most cases the flower-heads will stay the course required even with these imperfect materials, as long as they're kept out of the sun. During the next two or three days, any remaining still-attached parts of the old filaments usually die off and fall away from the flower, into the bag. This debris will be removed when you get to the fertilisation stage, at which point you will replace the old bag with a new bag. Note everything in your records. Put everything neatly away, until it is time to proceed to the next stage. 7. When the time is right – after a few days, get ready to introduce the pollen. Choose a flower which is displaying a goodly amount of pollen, (which you can see if you look closely – pull a sepal away if necessary. If the flower is just right, a tap of the stem, or a sharp blow of air, will cause pollen to be released in a swirl from the anthers. 8. Allow some time for fertilisation to take place. Leave the bag in place for two or three days or slightly more, before removing and discarding it. Don’t re-use bags unless very thoroughly cleaned. Carefully unseal and slip the bag away: Keep the label in place. Record actions in the notebook, so as not to forget any important details. Your records will be invaluable next year and beyond. Some books recommend re-pollinating the plant using the same pollen-source a day or two later, to ‘make sure’; well, that's ok, if you have the time and inclination, but I’ve never found it necessary or advisable. 9. If things have gone well, the seeds will begin to develop: Make sure the labels are ok each time you check, as the maturation process begins. Await full ripening, and then harvest your treasures!! 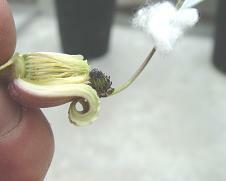 Three main points to be aware of: 1. guard against damaging the flower stalk itself, while carrying out the process - the cotton wool seal around the stalk does no damage, but occasionally the plastic seal will leave a dark mark on the stem - but as long as there is no stem breakage, seeds will normally mature in the usual way. 2. Keep the bags on for the correct time period, NO LONGER. You don't want to encourage any rotting. This will usually only happen if moisture builds up and the flower is left unattended, for days longer than necessary. 3. Keep the flower/bag OUT OF DIRECT SUN. Allowing the enclosed flower to linger in direct sunshine will greatly speed the decomposition of the emasculated flower. Once fertilization has taken place and the isolation bag has been removed, the intervention is over. Maturation then proceeds much as it would on any other plant. You have now overcome 90% of potential pitfalls and you are almost there. 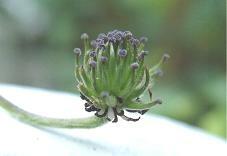 You’ll find yourself watching avidly as the seed heads steadily develop. Make absolutely certain that the labels on the old flower stalks remain firmly attached. Keep the ‘mother plant’ in tip-top health and watch out for any pests. Make absolutely sure that the vines carrying the seed heads are protected from accidental breakage. As the seed heads develop so too will your anticipation. You’ll find yourself glued to every detail of the seed maturation process. Don’t be tempted to remove seed early, just allow it to develop naturally and in due course it will attain ripeness and be ready to come away from the parent plant. At this point keep a sharp eye on the seed heads, as sometimes one or two seeds may become dislodged from the seed head prior to the main picking; these can be popped into a labeled envelope (or a match box) to await the final cropping. To keep the seeds dry and aerated use small paper envelopes, and always label them in advance - avoid using sealed plastic bags at this stage. Use one single envelope for each seed head so you know exactly what the contents are in every case. There is a sense of having achieved ‘alchemy’ because you have transformed base materials into ‘gold dust’. Success brings confidence and once you have completed the full cycle for the very first time you might consider that each new season is a chance to make new crosses. Many of your new seeds contain an embryo with a novel combination of genes. It is a matter of pure delight when, later, the seeds begin to germinate and produce small seedlings. C. florida × C. texensis seeds. As these plants develop, your enthusiasm, anticipation and expectation will grow to a point far beyond the normal limits. When these plants begin to produce flower buds for the very first time you will find it extremely difficult not to want to share the excitement with others. In hybridising you'll have successes and failures; put behind you any failures as no more than small steps on the road toward success; then immediately pot-up the resultant seeds, and get them exposed to winter's cold!